Today, just as tropical storm Danny was throttling the East Coast with rain and some winds, the hummingbird decided to come back for a visit. George went out in the rain to move the hummingbird feeder back to it's original position close to the house, and a hummingbird came very near him and just hovered and stared at him. It was a hummingbird showdown and the hummingbird won! We quickly ran in to boil and cool the sugar water, refilled the feeder, and the hummingbird came over and over this afternoon to work his way around the feeder. He was ferocious! We spent the rest of the day piddling around the house, with our eyes turned to the outside to see if he was there. Then one of us would shout from whatever room we were in..."George!" or "Yvonne, he's there!" It was all a lot of fun. 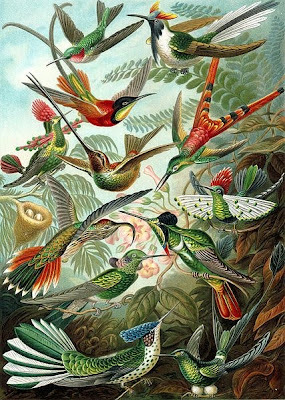 Every once in awhile we'd look at each other and say, "oh I'm so excited about the hummingbird." He's back, and we can't wait for first light tomorrow to start looking out there again. This is NOT the scene at our hummingbird feeder. We keep boiling, cooling, and adding the sugar solution, and we have seen two hummingbirds come on Saturday morning, but since then...nothing. The sugar solution is down about an inch today, so either the hummingbirds are coming all day when we don't see them or we have a leak! We have a wild turkey that has been hanging about our house for a week or more. He has decided that our sunflower seeds are better than food he gets elsewhere. He comes outside the window and clicks at us, which is sort of a light gentle clucking sound. That means, come out here with that jar of birdseed! Yesterday he hung around all day and finally just settled down under the apple tree and took a long nap. It was a hot day, and he was tired. Yesterday we had two hummingbirds that came to our feeder, which is a real treat for us (and hopefully for them.) They are so tiny they look like bugs. The are quiet and fleeting, and we hardly ever see them. We take a lot of trouble to boil sugar and cool it and put it out every two days so there is fresh sugar syrup for them. We were on hummingbird watch all day. And then we had this rather large Mr. Turkey hanging about. Two opposites in the bird world! George and I are going to New Orleans again for Labor Day. I'm really looking forward to spending three days in one of our favorite cities. I really love the restaurants and the music, but I also love to walk along the Mississippi and go on the Natchez river cruise and wave at the calliope player. It is just a lighthearted and fun city that knows the value of a good tourist! This trip we are going back to Commander's Palace for Saturday night dinner. We went for lunch on our last trip in May, and it was a memorable experience and one we can't wait to have again. Then we are going to head over to the Mid-City Rock and Bowl, to hear The Boogie Men, a group of 9 local musicians with a big band sound. 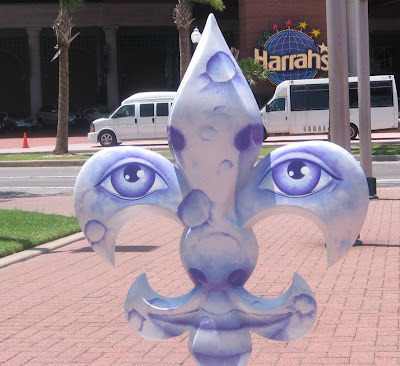 The group starts at 10:00 p.m. and that is late for us, but...hey,...it's New Orleans! Monday morning is Labor Day and our flight leaves early - 9:00 a.m. That is sort of a bummer, but we had free air line tickets that George won at the United Way Raffle last year, and...that's the flight they had. We'll be home early enough to feed the kitties and recoup a little before going back to work. Not a bad thing at our age. So, here we come again! 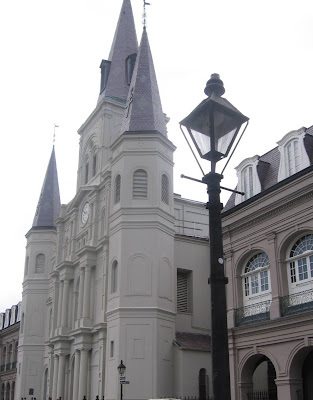 Our sixth trip to New Orleans. Who knew we would love this city so much! 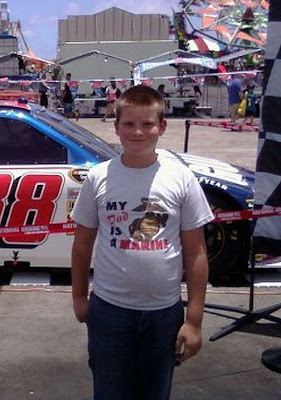 This is my grand-nephew Devin who calls me "Grandmaw Shea". He is the eldest of my mom's great grandchildren and a real honey! His father is serving in Afghanistan right now, and we think of him every day. I am sending a package of snacks and coffee today. God bless our troops who are over there trying to figure out how to end this war! Devin and his mom and sisters went to the Bayside Festival near the base in Hawaii where they live and took pictures for us. It is great to see the kids having fun on a sunny day with other kids who daddy's are serving in the military. All I can say is God Bless Our Troops....and their children! Simple farmstand with wonderful vegetables. Everyone was enjoying the sunny Saturday morning. George looking over the tomato fields. Verrill Farms had a fire last year and are rebuilding a beautiful new store. This morning we took a drive to a place called Verrill Farm in Concord. It was a beautiful sunny morning, and it seemed to me that we should try to get their early. Everyone in Massachusetts was on the road today and I wanted to beat the traffic. We got there at 9:30 and had coffee and the most wonderful cranberry scone. We bought beautiful purple carrots and long radishes and fresh corn and lettuce. We thought we were going to buy heirloom tomatoes, but they weren't on display. I think they were saving them for the tomato and corn festival which was to start at noon. They were setting up tents and getting the hotdog stand ready. I didn't want to pay the $8 admission, and I didn't feel like being in a crowd, so some lovely veggies on a beautiful morning suited me just fine. We drove past the fields of vegetables and sunflowers and into the dark woods of that part of the world. I always imagine what it was like to live there in the 1600s when the early settlers moved in and fought for American independence. The area is beautiful and the fields must look similar. Some of the clapboard houses from the 1600s are still there! We were home by noon with our bags full of beautiful vegetables and plants for our deck--a really nice Saturday morning! We had dinner tonight of lettuce with tomatoes and peppers from our own garden and corn from the fields with baked cod. I love simple meals cooked at home. 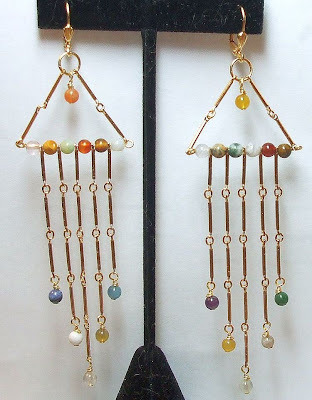 Tonight I made these earrings. I saw this design on the web, and just had to try it. They are really long, and really fun! I didn't feel like putting up my photo studio to take a picture, so this will have to do. I will take them to work and show them around for fun, and then wear them in New Orleans over Labor Day! Fun fun fun. I have a bad habit. I get up at 5:30 on Saturdays. I never get up that early when I have to go to work, but for some reason, I wake up and I have so many things I want to do; organize something, knit something, bead something, clean something, pet something....you get the idea. This morning the temperature is 58 degrees. It is sunny and still and beautiful. No one is up yet except me and the scampering kitties. Oh, and a backyard visitor. Mr. Turkey likes our birdseed. He has been here almost every morning this week. Our resident night time visitor in our backyard is a friendly skunk, who digs a little, skulks around and I think discourages the family of woodchucks under the garage and makes them find a new home. One of the teenager woodchucks was out there yesterday morning, but the whole family seems to have moved on for now. No damage to our garden lately, and...well...here's hoping. We like our sweet potato vines hanging from a window box on the deck, and our patio tomatoes are turning red. Patio tomatoes placed up on the table are our answer to woodchucks. Take that, Chucky! Simba and Safari are so happy to have me up and drinking coffee with them that it is hard to stay in bed on such a beautiful morning. Everyone is hungry for a new day! 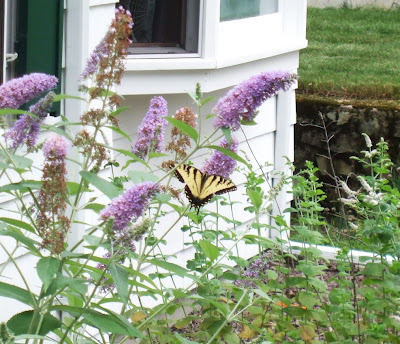 Three years ago I bought a butterfly bush. Lacking a better place to put it, I planted it in the garden. Without really thinking about it, I could not have chosen a better place. It was a small little plant, and I thought it would take root there, and I may have to move it. Not so. It has grown to be a nice large and happy bush, right outside my kitchen window. Now, what better place to view passing butterflies than right outside the kitchen where your spend time standing at the sink! Today I was thrilled to see a Yellow Swallowtail butterfly. I have long loved these butterflies, and I don't see very many of them. 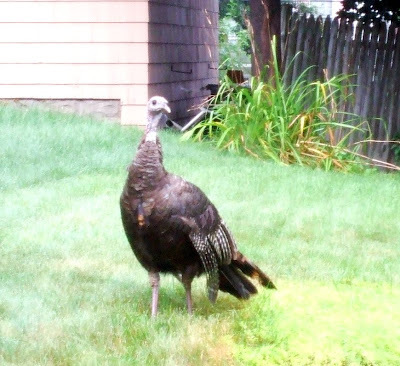 One time I was sitting outside at our old place in Woburn, and a huge one landed near me and hovered for a few minutes. I thought it was an angel! The second time I saw one was in Kentucky. We were driving down a lonely country road and there were a whole flock of small yellow swallowtails, also on the same road, for reasons only they knew! I was very excited. The third time I have seen one is today, right outside my kitchen window. These butterflies are not rare, and are not endangered, and most likely all of us have seen them from time to time, but I have seen them only a few times. What a treat to see one so close today!